Presenting nici raccoon wallpaper starring Rob Raccoon, one of the most popular nici soft toy. 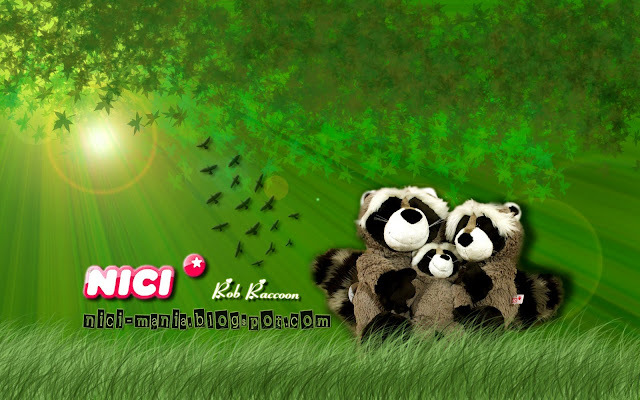 This raccoon wallpaper is made with a picture of our nici raccoons 50cm, 35cm and 25cm. 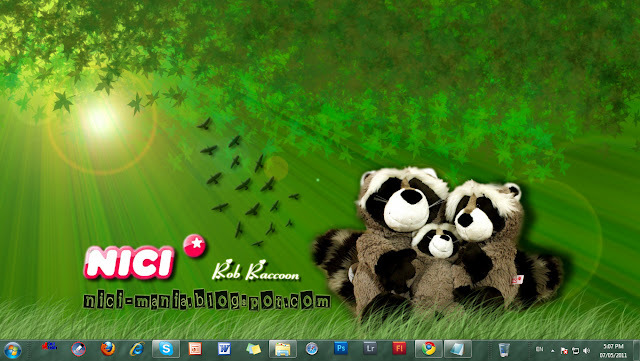 We are currently using this raccoon wallpaper on our Windows 7 desktop and loving it! We love this raccoon wallpaper a lot and hope you'll love it too. If you have already noticed, we have a crazy passion for drawing grass on our wallpaper. Its fun and easy to draw so this raccoon wallpaper is already the third nici wallpaper with grass, just a different color from the rest of them. Ute is thrilled with the wonderful green and says many thanks for this well-done wallpaper!!! I can't wait to buy my own Rob already~!